Introducing a franchise opportunity that gives you incredible freedom and potential. You'll work on weekdays. The initial investment is small. And best of all, you'll be able to take control of your life. We'll work with you and show you everything you need to know, from hiring your employees to expanding your customer base. Our franchise owners don't clean homes. We train you how to recruit, train, motivate, and manage your employees to do the cleaning.With your minimum investment, we offer a winning combination of people, technology, and our proven system to help you reach your growth potential. Ten million reasons. And counting. Over the last decade, residential housecleaning has become one of the fastest growing industries in the country. According to estimates, by the year 2006, over ten million households will use paid domestic services. It's currently approaching $20 billion dollars in annual sales, and the projected growth rate is 20%. During 1998 and 1999, on average, Molly Maid owners enjoyed double digit growth rates. We also have an incredible track record with repeat customers, which will help build your business faster. And because this is mostly a cash business, invoicing and managing accounts receivable is not a problem. The U.S. Bureau of Labor and Statistics states that "Cleaning services are expected to be the second biggest generator of new jobs for the period 1994-2005." This is truly a rock solid industry, with an expanding consumer demand. As a MOLLY MAID owner, your teams will brighten the homes of families every day, providing less stress in their busy lives, and more precious free time to spend doing what they enjoy. 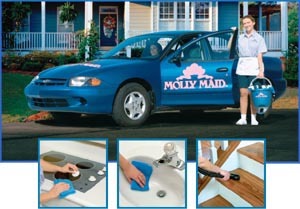 MOLLY MAID may just be the perfect business. A ton of potential -- without working nights and weekends. A small initial investment. Exploding customer demand. And the backing of a company that has won numerous awards and offers everything you need to help get your business off the ground. Plus, continuing support to succeed in the long run.